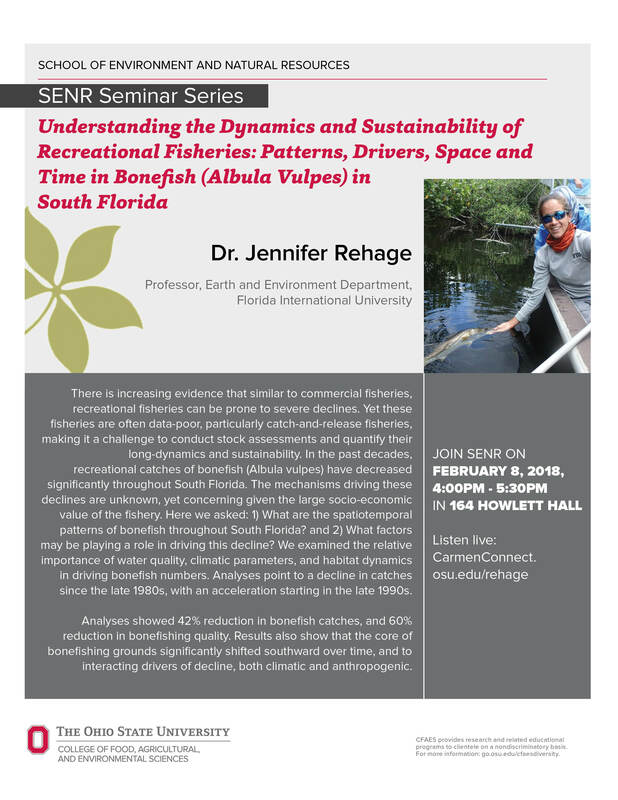 The SENR Seminar Series welcomes Jennifer Rehage, Professor at Florida International University. 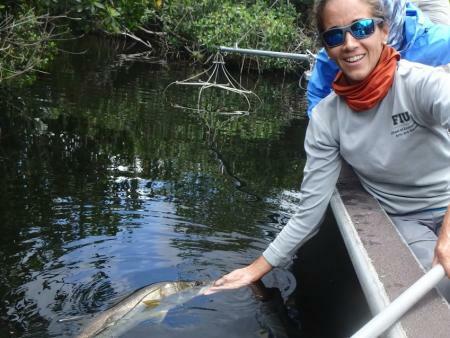 Dr. Rehage will present "Understanding the dynamics and sustainability of recreational fisheries: Patterns, drivers, space and time in Bonefish (Albula vulpes) in South Florida" from 4:10-5:30pm 164 Howlett Hall. There is increasing evidence that similar to commercial fisheries, recreational fisheries can be prone to severe declines. Yet these fisheries are often data-poor, particularly catch-and-release fisheries, making it a challenge to conduct stock assessments and quantify their long-dynamics and sustainability. In the past decades, recreational catches of bonefish (Albula vulpes) have decreased significantly throughout South Florida. The mechanisms driving these declines are unknown, yet concerning given the large socio-economic value of the fishery. Here we asked: 1) What are the spatiotemporal patterns of bonefish throughout South Florida? and 2) What factors may be playing a role in driving this decline? We examined the relative importance of water quality, climatic parameters, and habitat dynamics in driving bonefish numbers. Analyses point to a decline in catches since the late 1980s, with an acceleration starting in the late 1990s. Analyses showed 42% reduction in bonefish catches, and 60% reduction in bonefishing quality. Results also show that the core of bonefishing grounds significantly shifted southward over time, and to interacting drivers of decline, both climatic and anthropogenic.